The Board of Finance approved the town and school budget -- with a lower tax hike and a $700,000 cut to schools' request -- on April 3, 2019. 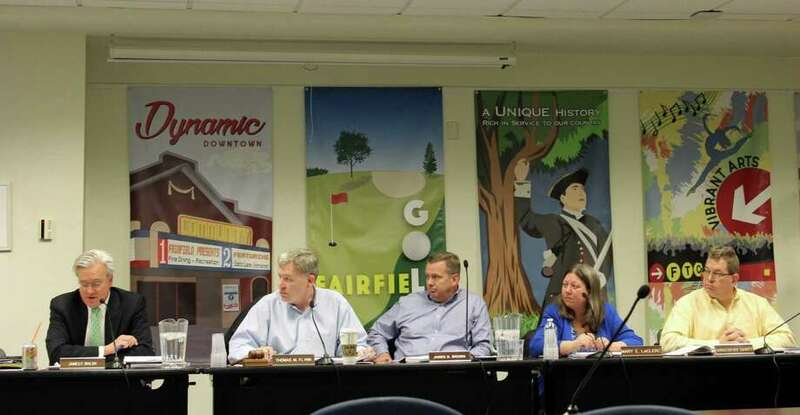 FAIRFIELD — In a meeting with occasional political jostling between Democrats and Republicans, the Board of Finance approved a budget that lowered a tax hike and held a $700,000 request reduction on schools. It now heads to the Representative Town Meeting for a vote scheduled for May 6. A $618,282 cut in expenditures and $335,000 increase in revenues brought down an originally proposed 2.4 percent tax hike to 1.9 percent, amounting to a mill rate of 26.86 for next fiscal year. With the adjustments amounting to nearly $1 million, the entire budget — town and schools — now comes in at a lower figure of $316,941,739, according to Budget Director Linda Gardiner. This represents a combined increase of 3.85 percent over the current fiscal year. The Board of Education — with most of its members present at the April 3 meeting — is still impacted by a $700,000 reduction to its original $182.3 million ask, or 5 percent increase, from the current fiscal year. Republican finance board member Jim Walsh questioned First Selectman Mike Tetreau’s proposal and reasoning regarding the schools budget cut. Democrats countered, noting the Board of Selectmen as a whole — two of three selectmen are Republican — had unanimously approved the budget with the reductions. Board of Finance members Sheila Marmion and John Mitola each proposed amendments seeking to restore $700,000 and $350,000 to the schools budget, respectively, but such efforts did not pass. Ultimately, the board unanimously approved the education budget as passed by the Board of Selectmen, coming in at $181.7 million, or a 4.6 percent increase over last year. During the finance meeting, Superintendent Toni Jones advocated for the $700,000 to be returned to the schools in a budget driven by maintenance and contract agreements. “Fairfield Public Schools is grateful for our elected officials supporting a 4.6 percent increase to cover primarily fixed costs, maintenance projects and utilities increases. Next will be RTM meeting,” Jones tweeted following the vote. Tetreau, who was not present at the April 3 meeting, has said his budget would allocate more funds — $2.7 million currently — toward paving next fiscal year. Back in the 2018 budget season, half a million dollars was taken out for asphalt paving and $20,000 for sidewalk maintenance, in what was then an effort to accommodate a burgeoning education budget. At first, Walsh proposed a $700,000 cut from Public Works meant for paving, bringing the total down to $2 million. After a change, the amount was instead reduced to $2.5 million but with $500,000 in contingency, pending a presentation from Public Works and Tetreau on a paving plan. The amendment was approved. The finance board also allocated $25,000 in funds to Parks and Recreation for investments in the marina waterfront. This item passed 6-2. There was no public comment session at the Wednesday evening meeting. The RTM is scheduled for meetings with department heads on April 9-10. A vote is expected May 6, followed by the establishment of the mill rate on May 9.